A Medial knee ligament sprain or MCL sprain is a tear of the ligament on the inside of the knee, usually as a result of twisting or direct impact, but may develop gradually over time. Initial treatment is to rest and apply cold therapy followed by a full rehabilitation program when pain allows. 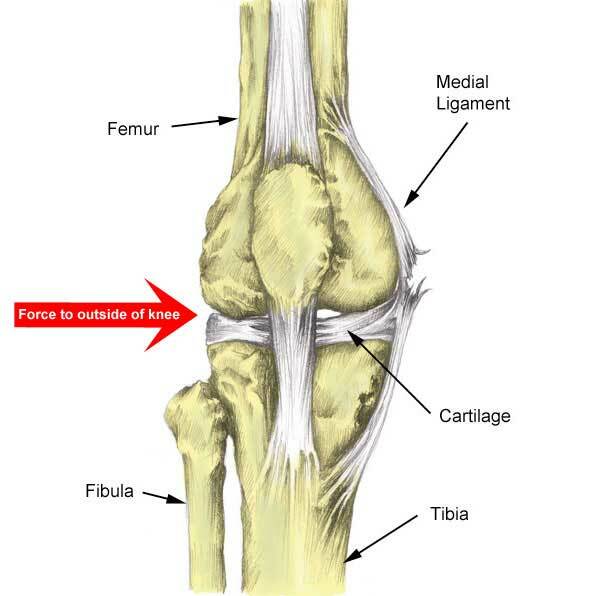 Medial knee ligament sprains are graded 1, 2 or 3 depending on the severity of the injury. Grade one injuries are regarded as a mild sprain, grade two as moderate and grade three as severe, often involving a complete tear of the ligament. For a grade 1 MCL injury, there may be mild tenderness on the inside of the knee but usually no swelling. The patient is likely to be able to walk or even run with minimal symptoms but not at 100% and they will likely experience some form of discomfort. When the knee is assessed using stress tests such as the valgus stress test, the ligament will feel stable with a hard end feel (no laxity) and minimal movement but there will be some degree of the pain somewhere along the ligament. Grade 2 injuries are usually associated with significant tenderness/pain on the inside of the knee where the medial ligament is and there is likely to be some swelling seen over the area of the damaged ligament. When the valgus stress test is applied, there is usually pain in the ligament and some degree of excessive movement in the joint (laxity of the ligament) although there is usually a definite endpoint as the ligament is not completely ruptured. Grade 3 injuries involve a complete (or near complete) tear of the ligament but pain levels can sometimes vary and it may feel less painful and not as bad as a grade 2 MCL sprain and the reason for this is that the injury has not only ruptured the ligament but also the nerve endings in the area. However, there is likely to be significant swelling in the damaged area and the patient may complain of having a very wobbly or unstable knee. Assessment tests, such as the valgus stress test will show significant movement in the joint (laxity) and the end feel will be soft as there is no ligament stopping the movement. A grade 3 MCL injury often occurs with other injuries in the knee at the same time, such as an ACL sprain. The valgus stress test is a diagnostic test that is used in cases of suspected MCL injuries. The therapist takes hold of the leg, ensuring the knee is slightly bent (approx 30 degrees). They stabilize the thigh whilst applying outward pressure on the lower leg (tibia) and this stretches the medial ligament. Pain on the inside of the knee and or excessive movement (laxity) with an altered end feel in the ligament indicates a positive test. The degree of damage can then be determined by how much movement/stability there is. 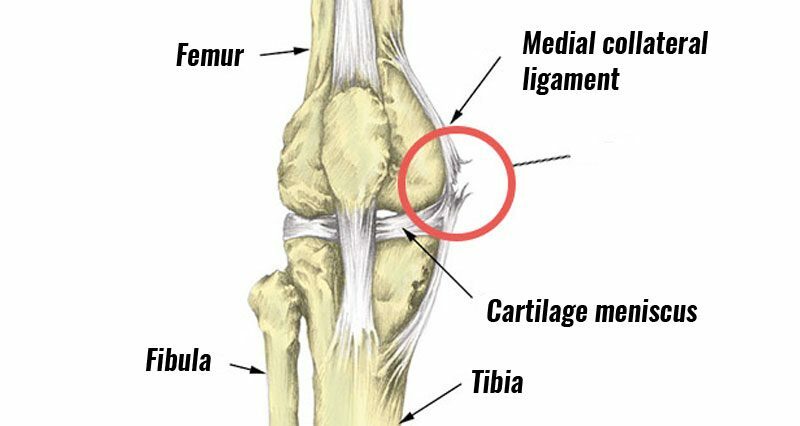 The medial collateral ligament (or MCL for short) connects the thigh bone (or femur) to the shin bone (or tibia) on the inside of the knee and prevents the knee joint from moving sideways, particularly from forces on the outside of the knee. The MCL itself has two parts to it; a deep section which attaches to the cartilage and capsule in the knee, and a superficial band that starts higher up on the femur to an area lower down on the inner surface of the tibia and is much more near the surface. Medial ligament injuries are common in contact sports such as football, rugby, and martial arts but they can also occur in activities of daily living as a result of falls that include a twisting action of the knee joint. Injury to the MCL often occurs after an impact to the outside of the knee when the knee is slightly bent. The ligament on the inside of the knee becomes stretched and if the force is great enough, some or even all of the fibres will tear. A grade one tear consists of fewer than 10% of the fibres being torn. A grade 2 sprain is upwards of 10% but not a complete tear of the ligament as in a grade 3. The deep part of the ligament is prone to becoming damaged first which may lead to a medial cartilage meniscus injury. Twisting the knee can also cause a medial ligament sprain as well as the possibility of an ACL tear. If the foot is planted and the player tries to turn quickly this can also lead to stressing the joint causing the inside of the joint to open and tear the ligament. Repetitive sideways forces on the knee (known as valgus forces) can gradually over time lead to an MCL sprain. For example, from kicking a football with the inside of the foot or from kicking in martial arts. However, pain on the inside of the knee which does not occur after a sudden injury should also be considered for pes anserine tendinopathy or bursitis. Treatment can be considered in terms of immediate first aid during the acute stage and longer-term rehabilitation which will depend on the severity of the injury. Sports Physiotherapist Neal Reynolds explains the treatment and rehabilitation process that elite footballers would undergo. Immediate first aid in the form of the PRICE principles (Rest, Ice, Compression, Elevation) should be applied as soon as possible. Apply ice or cold therapy wrap as soon as possible for 10 to 15 minutes and repeat every hour, reducing the frequency as symptoms allow. Ice should not be applied directly to the skin but use a wet tea towel or similar. Commercially available cold therapy knee wraps are convenient to use and will apply compression as well. Rest from training or any activities or movements which are painful to allow healing to take place. Continuing to train or do any activity which causes pain will only prevent healing and prolong recovery. Wear a compression bandage or knee support to help reduce any swelling and protect the joint. A hinged knee brace is best particularly for grade 2 and 3 injuries. It is a strong knee support which has solid metal supports down the sides to prevent sideways movement of the joint and protect the knee ligaments whilst healing. More severe grade 2 and full grade 3 injuries may require a limited motion hinged knee brace which also restricts the amount of movement or knee bend in the joint. When pain allows a full rehabilitation programme of mobility, strengthening and finally functional exercises should be done to return to full fitness and prevent the injury returning. Seek professional medical advice if in any doubt, particularly for suspected grade 2 or 3 sprains. What can a professional therapist do? Expert interview: Sports Physiotherapist Neal Reynolds explains medial knee ligament sprains. Ultrasound treatment involves applying high-frequency sound waves to the injured tissues. A professional therapist may do this in the early more acute stages to help control swelling and pain. Interferential or tens involves applying electric currents to the tissue around the injury which can also help with pain and swelling. Taping the knee joint can also provide a high level of support and protection. It can be done in the early stages as well as later on when returning to full training. A good taping technique can provide excellent support and often more support than some of the cheaper hinged knee braces, but the effectiveness of tape will reduce over time as the tape stretches slightly. It will need to be re-applied to maintain good support for the joint, particularly during competitive sport. Manual therapy techniques including massage may be used as part of a rehabilitation program. Massage to the injured tissues should be avoided in the early acute stages. Later as the ligament starts to heel then light cross friction massage may be used and in particular, if there is a persistent pain in the later stages of rehabilitation then cross friction massage may be beneficial. Most medial ligament injuries do not require surgical treatment. If there is additional damage to the joint for example an ACL tear as well then surgery may be considered. However, it is thought there is no advantage even with grade 3 injuries to treating them surgically as opposed to bracing and rehabilitation exercises. A mild MCL injury or grade one sprain should take 3 to 6 weeks to make a full recovery. A more severe grade 2 or grade 3 injury may take 8 to 12 weeks. A full rehabilitation program consisting of mobility and strengthening exercises should begin as soon as pain allows. Initially, mobility exercises are done to restore full, pain-free range of movement. In the early stages, isometric strengthening exercises (static muscle contractions) can be done to help maintain muscle strength and prevent muscle wasting whilst the ligament heals. As the ligament heals strengthening exercises such as mini squats, leg press, and step-ups can be done but movements involving a change of direction or sideways stresses should be avoided until much later in the rehabilitation program. A hinged knee brace should be worn to protect the ligament whilst exercising.